Published: Dec. 12, 2012 at 01:56 p.m. Updated: Dec. 12, 2012 at 10:30 p.m. The Pittsburgh Steelers and Dallas Cowboys never have been friends. Check out the best photos of Steelers vs Cowboys matchups through the years. The storied franchises each have played in an NFL-leading eight Super Bowls. The Steelers have won six of those games, the Cowboys five. 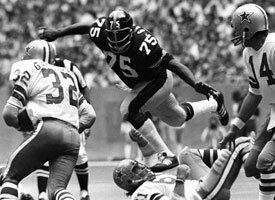 The Steelers beat the Cowboys in two Super Bowls back in the 1970s, but it was Dallas that waltzed out of that decade with the title of "America's Team" after NFL Films' Bob Ryan coined the phrase for the Cowboys' 1978 highlight film. That's ancient history to Ben Roethlisberger. The Steelers quarterback -- who has led Pittsburgh to two Super Bowl wins during an era in which the Cowboys largely have floundered -- believes the nickname is a sham. Big Ben told Ed Bouchette of the Pittsburgh Post-Gazette that if the Cowboys are "America's Team," the Steelers are "The World's Team." Chalk it up as a somewhat silly subplot to a Sunday game that looms as no joke for the loser. The Steelers and Cowboys share 7-6 records and find themselves in a fight for their playoff lives. Both teams are flawed, inconsistent and overtly mortal -- possibly an appropriate time to pump the brakes on staking claim to nations and planets.